Over twenty years ago I was part of the team who launched our organization’s ministry in a small Eastern European country. I remember our director frequently saying one of the advantages of working in such a small place was we could realistically make plans to reach everyone in the country. Fulfillment of the Great Commission in this small sector of the world was tangible. Real. Possible. This inspired us all. Do we feel the same way about the GLOBAL fulfillment of the Great Commission? It is human nature that we avoid tasks that seem impossible. If not impossible, they at least feel so large that any progress is functionally meaningless. Subconsciously, believing we make only a minimal impact, we limit our contribution to that which is manageable in our small area of the world. I believe it is time to raise our standards. Our objective is clear. When Jesus gave us the Great Commission it was to go and make disciples of ALL nations. Yes, ALL nations! In fact, it is the vision of our Lord Jesus Christ. He said, “This Gospel will be preached in the whole world as a testimony to all nations” (Mt. 24:14). In Revelation we read that every tribe, tongue, people and nation will be represented at the throne. God’s heart has always been for every person. Do we own that ourselves and take appropriate responsibility? Do we challenge what we do on a daily basis such that it actually contributes to getting to every person? In the 1960s, Bill Bright, the founder of Campus Crusade for Christ, began signing his letters “Yours for the fulfillment of the Great Commission in this generation.” By faith he understood our mandate was to get to every person. What he saw by faith, we believe is happening. The Spirit of God is moving amongst His people to complete the task. Amidst an unprecedented responsiveness to the Gospel, God has provided us with 21st century tools, resources and capacity. Hence, getting to everyone is not only possible, but imminent. 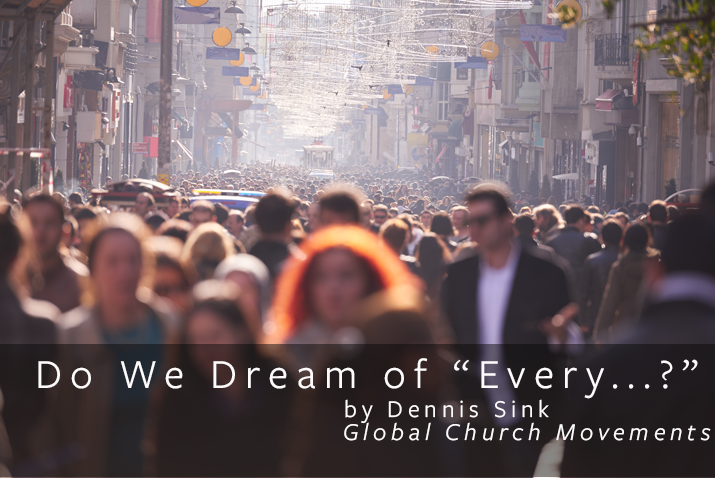 In Global Church Movements, we define our scope by saying that working together with the Body of Christ, we want to be used by God in a such a significant way that there is a multiplying church or faith community in every 1000 people – in every neighborhood, village, high-rise and digital community. Every. Not some, not most, but every.